screenprinting, will be addressed after a general introduction. Classroom, (Johnson, Stinett, 1990) and the "Silk Screen Printing"
be additional hazardous binders or preservatives, etc. hazardous due to presence of small amounts of toxic heavy metals. may ignite by spontaneous combustion. sheets (MSDSs) on all products used. 1. Pigment poisoning can occur if pigments are inhaled or ingested. while working, or inadvertent hand to mouth contact. damage in children), kidney damage and reproductive system damage. ulceration and allergic skin reactions. have not been well studied. 2. Use the safest pigments possible. Avoid lead pigments. not mix highly toxic pigments such as lead white or cadmium colors. damage affecting a silk screen artist. methylene chloride can affect the heart. can be fatal to a 5-year old child. exhaust fan at work level. drink containers. Always label containers. organic vapor cartridges can be worn. 10. Do not induce vomiting if petroleum distillates are swallowed. 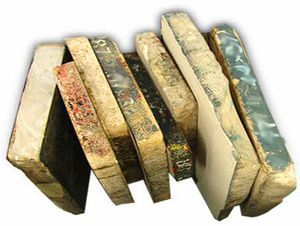 Acids are used in intaglio (acid etching) and in lithography. chromic acid, hydrofluoric and sulfuric acids. skin sensitizer, suspect carcinogen, and oxidizer. death if absorbed in large amounts. warning from contact with hydrofluoric acid. react explosively with other concentrated acids, solvents, etc. 2. Whenever possible avoid concentrated acids. front of a slot exhaust hood or window exhaust fan at work level. separately even from other acids. add the acid to the water, never the reverse. least 15-20 minutes and contact a physician. 10. Do not induce vomiting if concentrated acids are swallowed. are prepared with solvent-based vinyl lacquers. are the most dangerous to use. and aplastic anemia), lead additives, etc. which is moderately toxic, is often used as a thinner. allergic reactions, and are suspect cancer-causing agents. rosin boxes, around an ignition source. 6. Talcs may be contaminated with asbestos and silica. 3. Use the least toxic solvents. Gasoline should never be used. 4. Use asbestos-free talcs such as baby powders. 6. Do not use hydrofluoric acid if possible. fan 1-2 feet away is needed for vinyl plate lacquers. working with small amounts of solvents. where concentrated acids are mixed and used. worn when mixing or using concentrated acids. 13. Do not use phenol. hydrocarbons such as perchloroethylene and methylene chloride. damage, and methylene chloride heart attacks. Solvents section for the precautions with solvents. (e.g. window exhaust fan) is sufficient. local exhaust ventilation such as a slot hood is recommended. use or if using chlorinated solvents. including acid etching, drypoint, engraving and mezzotint. aquatinting. Sometimes, soft grounds contain more toxic solvents. flammable hydrogen gas is also produced. organic compounds, to cause a fire. asthma and dermatitis in some individuals. 2. See Solvents and Acids sections for specific precautions. level will also provide adequate ventilation. that exhausts to the outside, or outdoors. sparkproof metal cranks, explosion-proof motors, or compressed air. Don't use hair dryers to stir up rosin dust. involves accidents with sharp tools. which can cause numbness and pain in the first three fingers. Severe cases can be incapacitating. wrist flexing motions are minimal. because larger amounts of solvents are used. combustion hazard if improperly stored. of the wet rags by placing in a plastic bag. used if ventilation is not adequate. inks can be oil-based or water-based. CSA's data sheet on woodworking for more detailed information. 2. Accidents involving sharp tools can result in cuts. 3. Wood carving and cutting tools can cause carpel tunnel syndrome. etching, and for cleaning up after printing with oil-based inks. and water-based inks can be used with older children. minutes and contact a physician. the side or behind the hand with the tool. and thus can reduce musculoskeletal injury. materials and adhesives can be used in making collagraphs. 2. Epoxy glues can cause skin and eye irritation and allergies. 3. See the Solvents section for solvent hazards found in adhesives. used in making collagraph plates. neuropathy is not associated with its use. exhaust fan can be used if set up only 1-2 feet away. 5. Wear gloves when using epoxy glues. of plastic materials and resins. 2. See Solvent section for the precautions with solvents. 3. Use the least toxic material available. 3. Ammonia is a skin irritant and highly toxic by inhalation. enzyme detergents which can cause asthma, and chlorine bleach. These are skin and respiratory irritants. by inhalation and skin absorption. 1. Obtain a MSDS for all materials used. 2. See Solvents section for more precautions with solvents. possible. If you cannot substitute, wear gloves and goggles. Store it away from heat, solvents and other organic materials. solvents, and an ammonia cartridge for ammonia. metal halide lamps are safer. welding goggles with as dark a shade number as enables you to see. toxic dust respirator when mixing powders. Photoetching is usually done using the KPR products. lamps, or metal halide lamps. 1. See the Solvents section for the hazards of various solvents. miscarriages and birth defects in pregnant women. by inhalation and ingestion. It is a strong narcotic. 1. See Solvents section for precautions with solvents. should not work with these materials. ammonium bichromate, and photoimage wood engraving. asphaltum. See Etching under Intaglio for hazards of rosin dust. 3. Photoimage wood engraving uses photoemulsions. 3. Wear a NIOSH-approved toxic dust respirator when mixing powders. reprint this data sheet may be requested in writing from CSA. New York, NY 10038. Telephone (212) 227-6220.